A fabulous combination of locations and accommodation elevates this beyond being a simple bush and beach holiday. We’ve taken great care to avoid long journeys and frequent changes of location that make you feel as if you’re constantly packing and unpacking. Instead you’ll spend quality time in places that have delighted our travellers for many years. Although the Masai Mara is without doubt the most famous game reserve in Kenya, it is by no means the only one. Kenya has many other reserves and National Parks which also offer outstanding wildlife viewing. 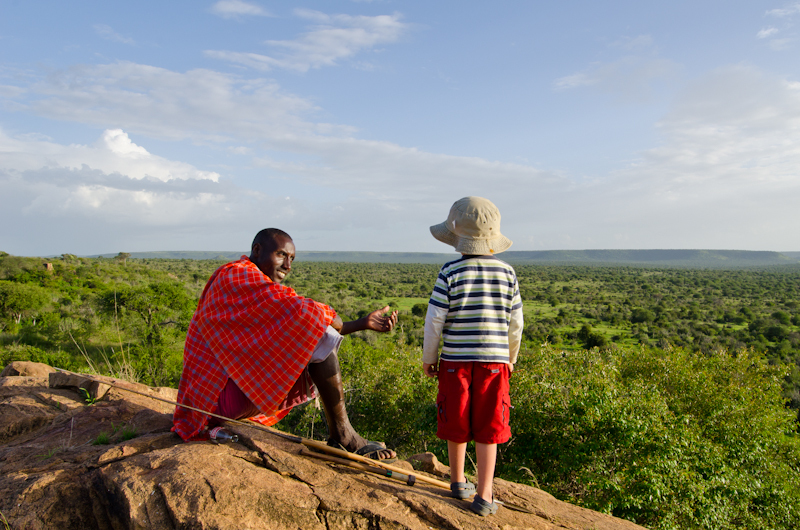 One of our absolute favourite areas is Laikipia, in central Kenya. The landscape here is very different from the wide open plains of Masai Mara and Amboseli which, in our view makes it even more interesting to visit. Laikipia does not get anywhere near the same number of visitors as Masai Mara which makes it the ideal location for those in search of a more laid back safari, where you won’t encounter many other tourists. The variety of landscapes and activities available here is unsurpassed and packs in more diversity than anywhere else in the country. After your wildlife experiences we’ll whisk you down to the palm fringed white sand beaches of Diani beach, by the Indian Ocean, where you can kick back and relax. Or, you can throw yourselves into the numerous water sports that are on offer. Laikipia: Game drives, night drives, game walks, rafting (water levels permitting) fishing, wild dog tracking, swimming, rock climbing, Samburu village visits. Indian Ocean: Swimming, snorkelling, wind-surfing, kite-surfing, diving, fishing. Day 2 After breakfast at the hotel transfer to Nairobi Wilson Airport for a scheduled flight to Nanyuki departing at 1020hrs. Upon arrival at Lewa airstrip, you shall be met by a camp representative and be transferred to Laikipia Wilderness Camp. After lunch you’ll set out for an afternoon game activity. 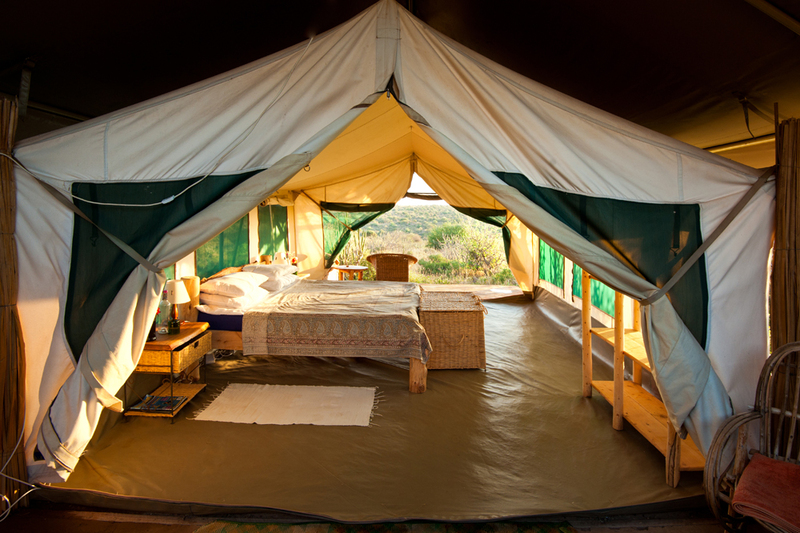 With just 5 tents, Laikipia Wilderness camp is a small intimate place to stay. 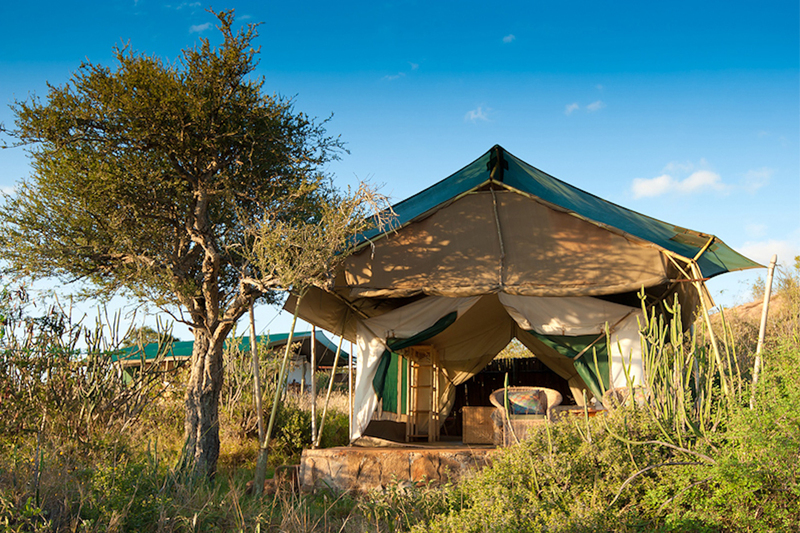 All tents have en-suite facilities and some are located close together specifically for families. All tents can comfortably sleep three people, and even a double and two singles for families with younger children. Each tent is built on a platform with a private veranda and behind the tent an en suite bathroom made of natural materials which is partially open to the skies allowing you to shower under the stars. Hot and cold running water offers just that little bit of extra comfort in the bush. The large mess tent is the central reception area with dining room, sitting room and library. Outside there is an open veranda on a wooden deck where guests can gather at night. There is also a viewing point with a campfire which is the ideal spot for dining out under the stars. 3 full days to discover this amazing part of Kenya. 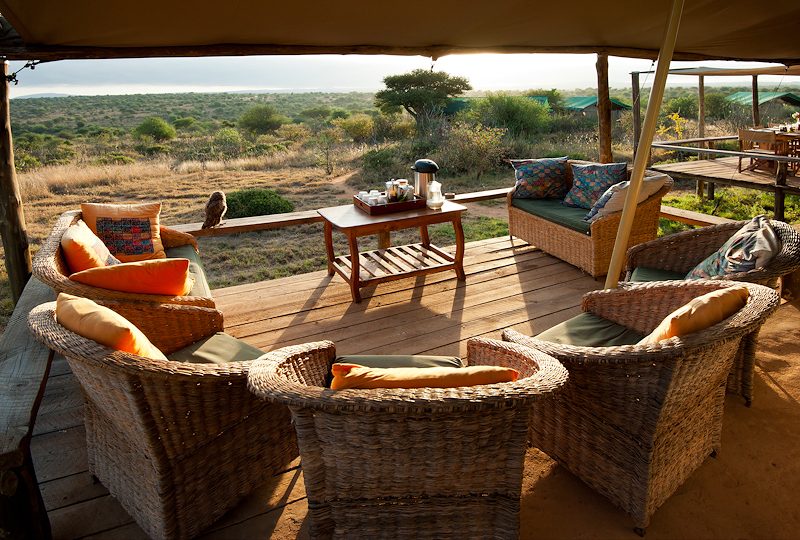 Laikipia is like nowhere else in Africa. Miles and miles of unfenced wilderness, beautiful scenery, wildlife that is on the increase and in greater numbers than almost anywhere else in Kenya. Blessed with a near perfect climate, wonderful people still very close to their tribal traditions and the freedom to explore this haven any way you can imagine. Unlike the endless open plains in the Mara, Laikipia boasts a wonderfully variable landscape; rocky outcrops, little rivers, riverine forest, acacia woodland, open plains and escarpments and we are incredibly lucky to have the option of getting out of a vehicle to explore this amazing area on foot as well as covering ground by jeep. Amidst this scenery elephants, reticulated giraffe, Grevy’s zebra, hippos, buffalo, warthog, lions, hyenas, bat-eared foxes and lots of antelope species are all commonly seen. Of the more exciting and interesting species you may not find elsewhere we are lucky to have excellent leopard sightings, striped hyena, aardwolf, aardvark and not least, some of the best wild dog sightings in Africa. A wide variety of activities include: game drives, game walks, night drives, rock climbing, swimming, rafting, fishing, Samburu village visits and tracking wild dogs. Day 6 After breakfast at the camp transfer to the airstrip for a scheduled flight back to Nairobi departing at 1130hrs. You will be met upon arrival by our representative and, with some time to spare before the flight to Mombasa, there is time to visit a local restaurant for lunch. Later, transfer to Jomo Kenyatta International airport for a flight to Mombasa where you will be met and transferred to Water Lovers, on the Indian Ocean coast south of Mombasa. 3 full days by the Indian Ocean. All eight Water Lovers suites are equipped with air condition, fan, mosquito nets, security box, audio station for i-pod, i-phone and other MP3 readers and a complimentary wi-fi internet connection. Both double and triple rooms are available. 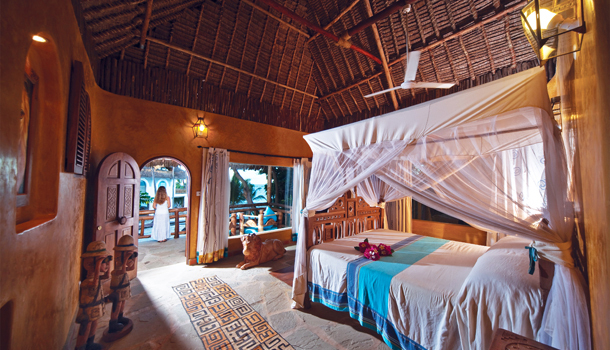 Every suite has a spacious private veranda overlooking the ocean and the style of the interior design is a blend of Swahili culture and Mediterranean style. 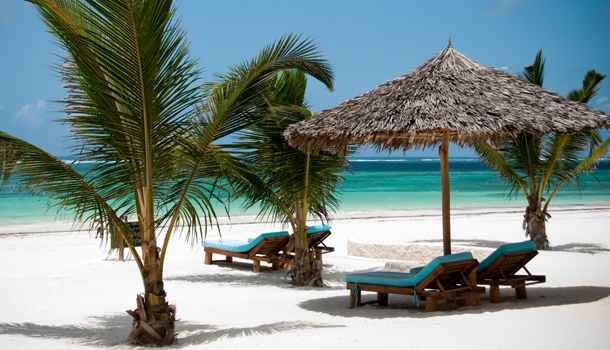 The long fine and white beach of Diani stretches along a beautiful 25 kilometres. The beach is very wide although this varies substantially during the day, depending on the tides. The coral reef is 700 metres from the beach and serves as a natural barrier, allowing for flat water inside and wave conditions close to the reef. There are no sharks and turtles can be seen even close to the beach. This is an ideal location for trying your hand at water sports. Day 10 After breakfast at the hotel you have time to relax before a transfer to Moi International Airport for your flight home. Prices – from £3,040 to £3,370 (depending on the season) per person in 2019 for family of 2 adults and 2 children.